I haven't done many of these posts over the second half of this year as I've mostly worked in TV and film, which has a slower turn around time than music video's. A music video will usually be released around four weeks after filming, but it can be several months before you see a TV show and when it comes to films it can be a couple of years. I worked on The Theory of Everything back in 2013 and that is only just being released on New years day 2015. 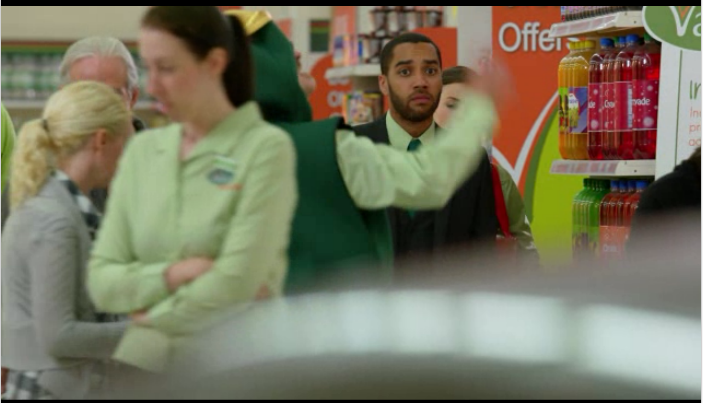 As series four of Sky 1 comedy Trollied has just finished I thought I'd let you know that I was in this series. I came in towards the end of filming but did five days on set and made it into three of the eight episodes that aired. 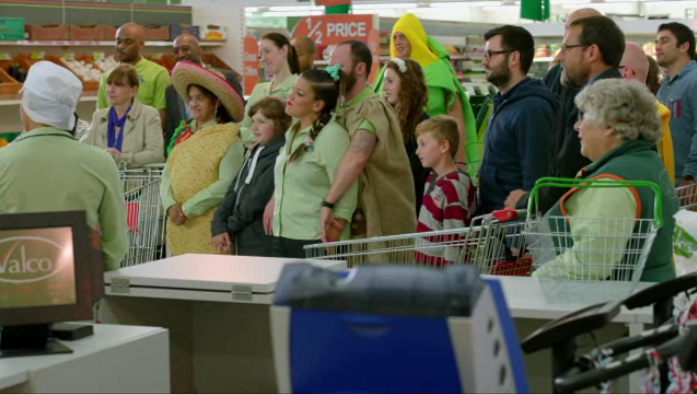 I had fun working on Trollied, filming isn't London based so it wasn't too far for me to travel and the supermarket set is really quite impressive, although very strange to walk into the first time. The worst part was that the 'fresh' fruit and veg really wasn't very fresh any more! 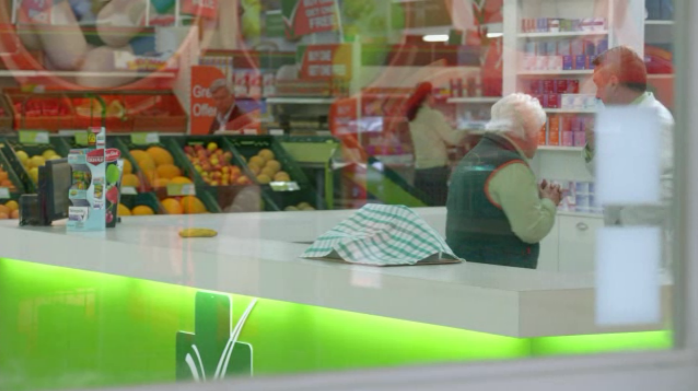 It's quite difficult to get screen shots of Trollied to try and show the background as anything out of main shot is usually blurry or people come out as blurs because they're walking. But I have managed to get some shots of me, or at least the ones that I actually managed to spot. I think I've got the episode numbers correct but Sky have got them confused online so I'm not entirely sure! This one looks really strange because they shot it through a glass door at the entrance to the supermarket. 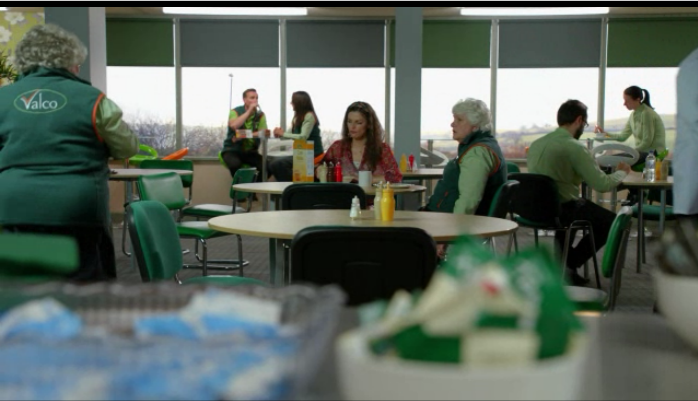 It's not very clear but I'm in the back of the shot stacking a shelf just over Margaret's shoulder. I'm sat in the back right hand corner eating my lunch (or not eating my lunch because it was stone cold so I was just pushing it around the plate!). I know I need to try and sit up straight but I do have a curvature at the top of my spine which makes it a little difficult. Most of my appearances were in the last episode of the series. The first image is pretty unflattering but I'm just behind the lady in the Sombrero. We were watching Gavin having his legs shaved for charity. In the second shot I'm just behind the man in the cheese costume while we're waiting for the raffle to be drawn. In the third one I'm actually right at the front of the shot but I'm blurry because I'm walking away (after not winning the raffle) and the shot is focused on Daniel behind me. The last shot was just before the end of the episode and I just walk across in front of the camera. So I got to be a Valco staff member. 'Serves you right'!